See it if you’d like to see an inspired, spare accounting of the most famous play in the English language. Don't see it if you want your Hamlet complete: this version is judiciously but extensively trimmed. See it if You love Shakesphere. Acting is excellent speaking Old English. Lots of laughs. Actors interchange rolls. Actors switch rolls nightly. See it if you enjoy Shakespearian plays, shows done in-the-round, and simple staging. Don't see it if you don't enjoy productions where classic roles are gender-swapped or want to see something flashy. See it if You are open minded about gender roles. Each actor is perfectly cast. 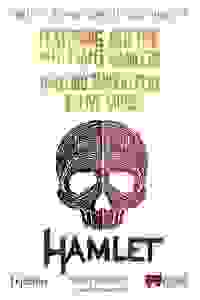 This is Hamlet performed with humor, emotion and intelligence. GO! See it if To see or not to see. (Yes slap me it's fine.) Look, it's Hamlet and the players are good. If you like Hamlet, you should go. Don't see it if You aren't into Shakespeare. You need a big fancy set and period costumes. Etc. See it if You want a well-trained classical cast that lets the text work on its own w/out unnecessary business. You want a modern take on Shakespeare. Don't see it if You want Hamlet in it's original, uncut version. You prefer more classical styling of Shakespeare. You dislike intimate staging. Don't see it if You dislike Shakespeare &/or prefer bells & whistles with your productions. Also, if you cannot climb stairs. See it if streamlined versions of Shakespeare's plays appeal to you. Don't see it if you're a purist who believes that the most famous play ever written should never be cut in half. See it if you would like to see talented actors in an entertaining & interesting version of Hamlet in a very intimate space. Don't see it if you only enjoy traditional stagings of Shakespeare (or you don't like Shakespeare). Also The actors were excellent, especially David Andrew Laws as Hamlet. See it if You like intimate performances and enjoy seeing Shakespeare with some uncommon casting. Don't see it if You want a big show with lavish costumes and sets. Or if you can't walk up and down stairs. See it if You want to consider gender implications in the bard's work. This score is for the female-Hamlet version, which was riveting. See it if You love Shakespeare and want to see a unique take on a classic, and prefer minimal staging so the focus is on the words. Don't see it if You don't like classic Shakespeare tampered with, prefer plays with elaborate sets and props. See it if you like WS re-visited. Female Hamlet works fine;male Ophelia less compelling. Actors thru-out theater. Music/drum is strg addition. Lively. Don't see it if you want all actors great. Older actors less strong. Claudius was weak: spoke softly, quickly, w/o feeling; fumbled lines. Polonius meh. Also Some of the actors barely had parts (R&G, Horatio, etc). See it if you want to see a great cut of Hamlet done with captivating actors and staging. Don't see it if you don't like Hamlet or good acting. Don't see it if You want classical theatre to be proscenium style, without creative liberties taken. See it if You want to watch a version of Hamlet you could actually love twice. Don't see it if You hate thrilling theatre. See it if You love Shakespeare and his words. Appreciate incredible acting. You like comedic dramas. Don't see it if You prefer set and lighting design to story and acting. Also The staging is minimal, but the actors carried the words with such humor and emotion that an extravagant set would have been unnecessary and distracting. The gender reversals were used incredibly well. It brought a whole new dimension to the characters. I have seen several gender reversed Shakespeare productions, but I feel that this production brought the most to the table. Don't see it if You do not enjoy Shakespeare plays that are aggressively cut to fit into approximately 2 hours.